Working to protect and promote wildlife in Harlow. Several projects in the Stort Valley in Harlow, although separately funded, are part of the same longer term vision - see Stort Valley summary page. The objective of this project is to restore the wildflower population and the associated pollinating insects in one of the meadows in the Stort Valley, Harlow. The meadow was raised up to a metre above natural during the building of the new town for sports pitches. The meadow had been seeded with vigorous grasses and managed for many years by a conventional mowing regime, and as a result had very little floral content. The restoration process comprises cutting and removing as much of the old grass as possible, followed by herbicide spraying to get rid of what remained, soil cultivation, and sowing a seed mixture of non-vigorous grasses and 23 native wildflower species. Funding of £10,000 has been obtained from the Tesco Bags of Help scheme. The contractor started in March 2017, and completed the sowing of the wildflower seed mix in September 2017. The seed mix has since germinated well, and the meadow has been a colouful sight with a succession wild flowers appearing in spring 2018. 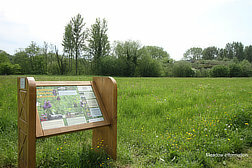 An interpretation board for the meadow was installed by volunteers in May 2018. The key to the success of the project will be appropriate mowing of the meadow at the right time of year. For detailed information about the project see the project page. For the latest information on progress see news page. This project was to revamp the footpath network on the Town Park Marsh Local Wildlife Site (LoWS) (Town Park, Stage IV), and add a picnic area and some interpretation boards about the site. One section of path, which used to get waterlogged in winter, was re-routed via a new footbridge, and the paths and existing bridges over ditches were upgraded for disabled access. The Stort Valley Meadows - Access for All project has been funded through the Community Spaces programme managed by Groundwork UK as an Award Partner to the Big Lottery Fund. Community Spaces is part of the Big Lottery Fund's Changing Spaces initiative. Funding made available for the delivery phase of the project is £49,999. The project was completed in August 2012. In this part of the project an area of reed-bed plus new pools were created adjacent to the paths improved in phase 1. An area of shallow open water was also created in a new conservation area, and the vehicle access bridge on to one of the meadows rich in wild flowers was widened to facilitate the proper maintenance regime of cutting and collecting, necessary to prevent nutrient levels rising and consequent loss of biodiversity. In conjunction with the Essex Biodiversity Project, funding of a further £44,000 was secured in October 2011 from Veolia (Landfill Tax funds) with 10% match funding coming from the Stansted Airport Community Trust for phase 2 of the project. The project was completed in autumn 2013. This project has been to revamp the footpaths along the main rides to make the wood accessible to disabled visitors and to give vehicle access to the site to facilitate future woodland management. Kissing gates have been installed at the main access points to prevent inappropriate use of the wood. In addition to the main ride improvements a walking route has been opened up to the rights of way network east of the site with a rustic bridge built by volunteers over the eastern boundary ditch. Habitat improvements have consisted of three woodland glades being cleared, and two small ponds dredged and opened up to the light. A project to cut a ride round the periphery of this SSSI woodland and install waymarkers with benefits for wildlife and access. Unfortunately our application to BBC Breathing Places was unsuccessful. The project was carried out later by Harlow Council using mainly volunteers. Return to Harlow Wildlife home page. © Website design by A.G.Tomlins. This page written by Andrew Tomlins.